Cool article and review about the Cray-1 the first really high end production supercomputer. It cost $8 million and performed at blistering 80 MFLOP/s. For comparison, a Pentium 4 2.8ghz can hit about 2.5 GFLOP/s or about 31 times faster. The current supercomputer champ can handle 280 TFLOP/s or about 350,000 times faster. “Step into the computer,” said my guide. I did, and felt the chilling sensation of moving into the megabit maw of a machine so advanced in electronic intellect that it can only talk to other machines. For a moment, I was apprehensive. It was like entering a silicon crypt. The air was significantly colder inside the polyhedral chamber than outside. Yet I knew that I was surrounded by hundreds of thousands of heat-producing electronic circuits, drawing six times as much electricity as any other machine in the room. This was the CRAY-1, the amazing supercomputer designed by a reclusive Wisconsin genius. It’s 10 times faster than the biggest IBM computer on the market. And this particular CRAY-1, installed in a major computer center in Kansas City, was being fed by two giant Control Data computers just to keep it busy. “You’re looking at the architecture of Seymour Cray,” said a voice floating over the top of the computer. The voice belonged to Jack Lorenz, president of United Computer Systems and owner of the first commercially installed CRAY-1 system. I saw what he meant. The CRAY-1 is unique, not only in electronic architecture and performance, but in size and shape as well. It doesn’t look like any other computer. From the outside, the CRAY-1 resembles one of those automatic photo machines that give you four fuzzy photos of yourself in a minute or so. It’s a hollow, 16-sided column, 6-1/2 feet tall, nearly five feet wide, and surrounded by upholstered benches. Four sides are missing to give access to the interior, which has no ceiling. Standing in the CRAY-l’s chilly centerâ€”it’s one of the few computers with built-in refrigerationâ€”I was struck by the wiring. Each of the 12 vertical panels was a thick, solid mass of blue and gray wires. There is no color coding in the CRAY-1. How does one tell the wires apart? One doesn’t. I walked out of the CRAY-1 and back into the real world of more familiar computers. UCS sells computing services, and its data center holds 18 other machines, most of them large, rectangular Control Data units such as the 6600 and the Cyber 175. Compared with the older computers, the CRAY-1 looks like a decorative toy sitting in the corner. The upholstered benches contain the computer power supply. The entire computer covers just 70 square feet of floor space. Yet its capabilities make it the premier performer in the room. Seymour Cray not only made the outside of his machine look different. Its internal structure is technologically a radical improvement. The CRAY-1 is fast. It will cruise along at 80 MFLOPS. That’s 80 million floating-point operations (such as addition or multiplication) per second. With some computations, there’s an overlap that pushes its speed to 140 MFLOPS. And in short bursts, the CRAY-1 has been clocked at 250 MFLOPS. By comparison, a Cyber 176 or an IBM 360/195-each superfast by former standardsâ€”chugs through its duties at four to seven MFLOPS or less. That’s why it takes “front-ending,” putting another computer on line as an input-output device, to get efficient use from a CRAY-1. Even then, the supercomputer has time to rest. Such jobs require a computer to run lengthy batches of similar calculations, each only slightly different from the last, until the best possible solution is found. To find out why the CRAY-1 is so fast, I visited Cray Research headquarters in Minneapolis. Seymour Cray himself works in isolation at his laboratory in nearby Chippewa Falls, Wis. A shy, introverted man of 54, he repeatedly shunned interviews. He is more comfortable with computers than with people, and designs sailboats for relaxation. His outside contacts are limited to rare discussions with potential customers or other technical experts. Cray’s genius sparked early. He was 32 when he left Univac with a group of co-workers to found the Control Data Corporation. CDC’s first commercially successful computer, the 1604, sprang from his pen, its intricate circuitry drawn quickly, but carefully, on page after page of graph paper. Working often alone and late into the night, he followed with the CDC 6600 and 7600. The problem of designing faster and faster computers is Cray’s passion. Each time he solves the problem, he starts over again to do it better In the CRAY-1, he solved it by combining unique electronic circuitry with mechanical engineering. In the CRAY-1, simplicity means a design with only three kinds of integrated circuit chipsâ€”one for memory, one for logic, and one for internal register. The finished machine contains more than 350,000 chips. But it’s the way they’re put together that makes the CRAY-1 a supercomputer. One major limiting factor in computer operations is the speed at which a signal travels through connecting wires. The longer the wire, the longer it takes for a computer “message” to get through. And a signal that must work its way through a wire maze in a computer filling a 12-foot cabinet will take longer than a signal zipping around in the CRAY-l’s five-foot polyhedron. Cray reasoned that a circular cabinet offered the best way to keep wire lengths to a minimum. He flanked the computer’s central processing unit (CPU)â€”its logic, or brainâ€”with banks of memory chips. Cray’s concept for the computer cabinet also yielded the densest packing structure for the thousands of circuit boards filling each machine. Rather than individual boards as in conventional computers, Cray sandwiches groups of them together to form plug-in modules. “These modules are the key to everything,” Higbie said, handing one over for my inspection. It was heavy, and measured about six by nine inches. Each side was lined with small integrated circuit packages. The CRAY-1 had 113 different module combinations using the three basic circuits. A full module holds 288 circuits. boards holding the chip packages. Interior boards carry the electronic impulses over printed circuitry. But, rather than running in straight lines, the etched wiring zigzags back and forth from a source through chip packages. Each silvery little pathway looks like a child’s maze. Some are long, with dozens of right-angle turns. Some are short, with only a few. In the world of supercomputers, that timing is measured in nanosecondsâ€”billionths of a second. The six-inch width of a CRAY-1 circuit module equals one nanosecond, with a signal traveling in a straight line. A signal zigzagging across the module takes longer. Cray’s design gets maximum efficiency in computing power by exercising that rigid control over signal timing. With most non-etched wires being only one foot long, signals waste little time en route, but always arrive at the appointed nanosecond because of the maze-like board etching. Even with a number of circuits and boards involved in any given computation, the CRAY-l’s time for an average calculation is just 12.5 nanoseconds. That converts to 80 million calculations each second. The modules themselves are packed so densely into framesâ€”up to 72 of them in a 28-inch chassisâ€”that they almost touch each other. That packing helps minimize the distance signals must travel, but it leads to unique heating problems. The CRAY-1 draws 100 kilowatts of electricity, more than any other commercial computer. In comparison, astronauts operated the Skylab space station on less than 10 kilowatts. A typical home may draw six kilowatts at peak moments. With each circuit board generating heat, Cray knew that a new cooling scheme was needed. The air-conditioned coolness of normal computer centers wouldn’t do for his machine. That led to the middle layer of Cray’s five-layer module, and to some unique plumbing in the computer framework. The copper sheet’s edges are left bare. When the module is installed in the chassis, those edges fit into the notches of an aluminum cold plate. Within the cold plate are stainless-steel tubes carrying Freon refrigerant. The refrigerator unit itself is in the floor below the computer. The constant flow of Freon draws heat away so rapidly that the CRAY-1 is actually cooler than its air-conditioned surroundings, though it may warm up in prolonged operation. That accounts for the sudden chill I felt when I first stepped into the machine. Although the CRAY-1 is physically designed for speed, its mental formatâ€”just how it handles numbersâ€”is different, too. It’s a vector processor. Most computers are scalar. That is, they perform one computation at a time. Each result goes into memory, then is retrieved, as needed, for other computations. Vector processors, however, perform multiple computations, usually adding, subtracting, multiplying numbers all at once. In its simplest form, vectorizing is like setting up an assembly line of numbers. Each equation is loaded in part at the beginning of the line. And at each point, or segment, the numbers are manipulated in a certain wayâ€”added, subtracted, etc. But, as each operation moves down the line, another set of numbers enters at the beginning. The result is that the computer handles many sets of numbers at the same time, and uses complex formulas to keep track of them all. The real benefit of vectorizing comes when massive groups of numbers must be processed. Like a car assembly line, it may take a week to produce the first one, but from then on, one rolls off every minute. Each step in the vector process gives an interim solution (see diagram) used in the next step. In the CRAY-1, those solutions are “chained,” used directly without going to and from memory. It’s this vectorizing ability that makes it 10 times faster than any other commercial machine. Even for single operations the CRAY-1 is fast. For these, it can be used as a conventional scalar computer; and it’s still twice as fast as any other machine. A vector computer is a very rare breed. There are only about a dozen non-Cray vector computers in the world. And none of them, with the possible exception of the one-of-a-kind ILIAC IV installed at NASA’s Ames Research Center, matches the Cray in performance or reliability. By early 1979, Cray had delivered eight machines and had orders for four more. Cost: about $8 million each. Who needs such massive computing power? even so, some nuclear research will tax its ability. Two machines are involved in weather-related projects, one at the National Center for Atmospheric Research in Boulder, Colo., and one at the European Center for Medium-Range Weather Forecast (ECMW) in England. ECMW issues 10-day weather forecasts for the European continent each night. Thousands of variables go into the computer to be vectorized through billions of calculations leading to a forecast. Even with the CRAY-1, the calculations take nearly 10 hours to complete. Two machines went to the Department of Defense. Rollwagen can’t say where they are or what they’re doing. But some reports hint that they’re engaged in code breaking. Two more are at Lawrence Livermore Laboratory, where they are being used to solve the problems of magnetic and laser fusion. And the eighth is at UCS in Kansas City. The success of Cray, along with signs that CDC will be back with an improved vector processor in 1979, already is spawning peripheral businesses. 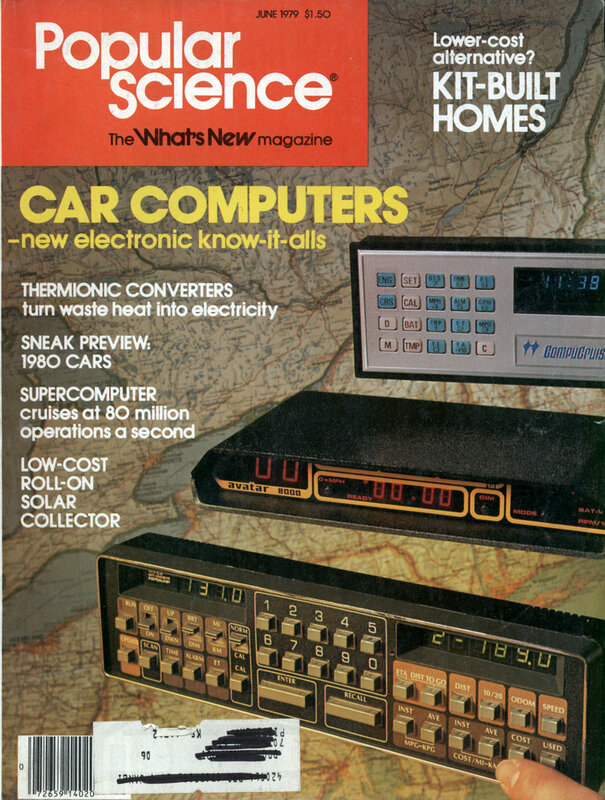 True to computer-industry tradition, the hardware is ahead of the software, or programming. 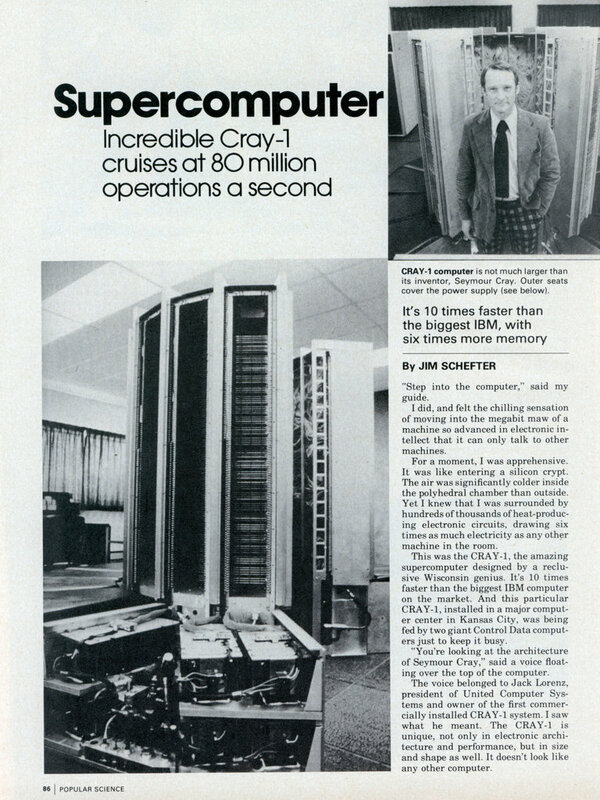 Cray significantly increased its programming staff in 1978, but a small company called Massachusetts Computer Associates, Inc. (Compass) beat it to one important element that opens the CRAY-1 to a variety of scientific applications. Compass developed and copyrighted a program they call a “vecto-rizer,” which translates standard computer code into a modified version that speeds through the CRAY-1 logic. Shortly after the UCS CRAY-1 became available to commercial users, Compass analyst Bob Brode worked with Continental Airlines on one application. The airline’s problem was to assign crews in the most economical way. They had to consider such factors as flight schedules, crew pay, layover costs, motels, meals, and more. Each year the airline spent several hundred thousand dollars in computer time just to find the best schedule. “There are millions of possibilities, so the computer has to sit there and do the same section of the program over and over again with just slightly different data,” Brode explained. The vectorized program ran 2-1/2 times faster on the CRAY-1 than on other machines, and Continental will save up to 60 percent of its former costs, he said. “Any program, commercial or otherwise, that requires that kind of repetition is worth vectorizing,” he added. The people who build supercomputers agree. Seymour Cray has retreated to his Chippewa Falls hideaway and already is well along on designing the CRAY-2. Wow, thanks for posting this. I worked for Cray Research from 1984-1996, where I debugged Cray 1 and Cray 2 modules. I left briefly in ’90 to work with Seymour on the Cray 3 project. His designs were always amazing, both from a technical and aesthetic standpoint. BTW comment text is only 3-4 pixels high on my screen, is that intended? It’s not supposed to be that small, what browser are you using? How does this compare to todays computers? Am I right that they did all the 3d modelling for The Last Sterfighter on a CRAY? Ohh BTW, what’s actually quite amazing about that computer is that it had to incredibly high amounts of memory. As far as I know it usually had 2 Gigabytes. That’s even much today, but must have been a truely mind-boggling amount back then. The CGI for Last Starfighter was done on a Cray X-MP system. While the old Supercomputer is of some interest, it was Seymour’s strides that caught my eye. Ehgads! Look at those checks.